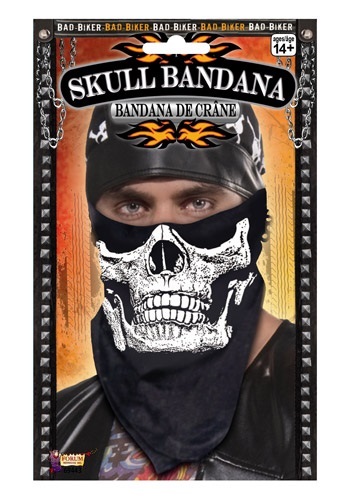 Triangular bandana measures 30" x 15"
When you're out on the open road and enjoying the wind rush by your body while looking like an absolute stud on your steel stag, the last thing you want is a nasty bug to fly into your mouth and make you look like a total punk in front of all your biker friends while you gag on the crunchy exoskeleton. Save yourself the embarrassment and even give your street cred a little boost (lets face it, its gone way down with all the bugs you've been choking on lately) with our Skull Face Biker Bandanna! With an extremely detailed skull printed over a pitch black back drop, not only will your friends quit laughing at you due to this new found respect, the bugs that used to just meander right in your way will take notice and maybe even fly the other way! No need to worry about ever getting wings stuck in between your teeth anymore! Hooray!